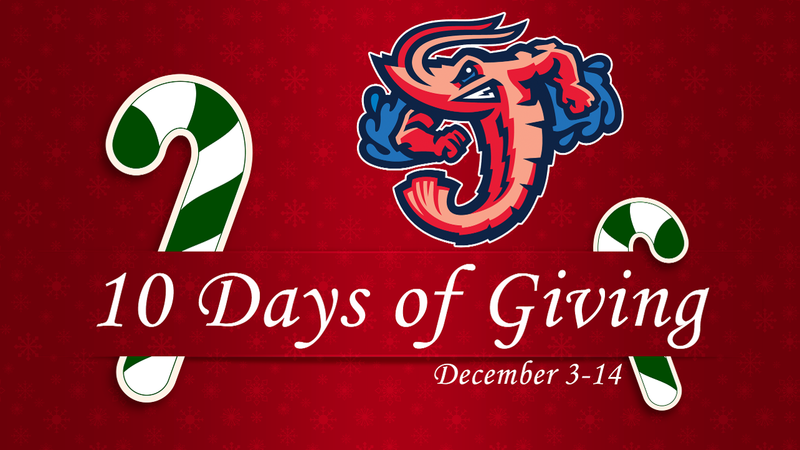 JACKSONVILLE, Fla. (Dec. 3, 2018) - The Jacksonville Jumbo Shrimp are celebrating the holiday season with 10 Days of Giving, the club's annual two-week promotion that awards experience-based prizes for 2019 home games. This year's rewards include guaranteed giveaways throughout the 2019 season, a free luxury suite night at the Baseball Grounds of Jacksonville and various Jumbo Shrimp experiences. Each weekday from Monday, Dec. 3 through Friday, Dec. 14, a random winner will be selected daily and announced on www.JaxShrimp.com, the Jumbo Shrimp's Facebook page and the club's @JaxShrimp Twitter feed. Fans may purchase any of the Jumbo Shrimp's 2019 packages by calling (904) 358-2846. Each daily drawing will include entries up to 5 p.m. of the given day. No purchase is necessary to win prizes. Fans may enter by either emailing win@jaxshrimp.com or completing an entry form between 9 a.m. and 5 p.m. Monday through Friday at the Baseball Grounds of Jacksonville at 301 A. Phillip Randolph Blvd. Each daily drawing includes entries up to 5 p.m. of the given day.